We had dinner before the show at Lecösho, a place we’ve never been. Since we paid for parking at Benaroya Hall, we could walk to the restaurant from the parking garage, just a block west in Harbor Steps. 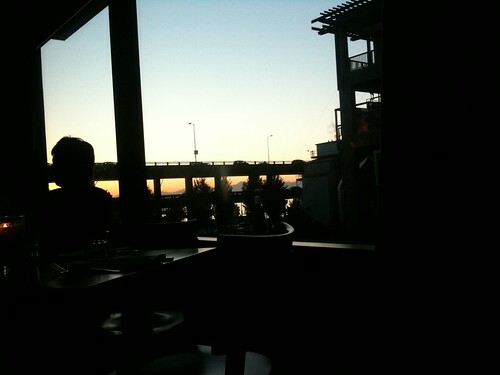 It was a great evening and we caught the end of the sunset from the restaurant. We had Penn Cove mussels and beef short ribs for appetizers, I had the salmon (of course) for my entree and Gay had the Porchetta, which was stuffed pork wrapped in pig skin cooked slowly for several hours. For dessert, I had an ice cream sandwich, which was a scoop of chocolate ice cream, a scoop of blood orange sorbet and a scoop of corn and cinnamon (!) ice cream sandwiched between two pieces of shortbread. Gay had the chocolate torte. Everything was very good.I had the Saison DuPont farmhouse ale with dinner, which went well with the food.